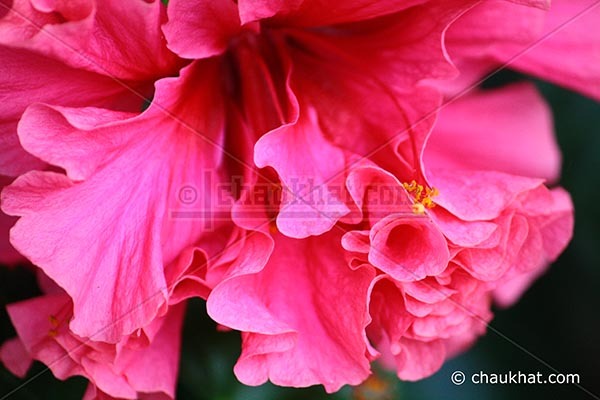 Do you know that the hibiscus flower has about 220 types? The flower has received its name from the greek word ἱβίσκος [hibískos]. A famous author in the first century, named Pedanius Dioscorides had named marshmallow flower as ἱβίσκος. It has a few other names like rosemallow, sorrel and flor de Jamaica. Let this be some knowledge, and tell me how you feel seeing this hibiscus flower photographed by me. Congratulations on being the contest winner. You deserve it. Well done. It is a beautiful closeup. Like the shades very much. @ The Abbot: Thank you sir. Thank you so much! Reminds me of a place I've visited about 20 times - the lovely islands of Hawaii! Beautiful. you have captured the texture so beautifully! love it! @ RNSANE: Oh! That's what I say a real paradise.